Hello to you all. This month seems to have gone past in a bit of a whirlwind. I was gobsmacked to receive a nomination for the best book blog category in the Annual Blogger’s Bash earlier in the month, which is the first time my blog has been nominated for an award. Thank you to whoever nominated my blog. I managed to fit quite a lot in for the shortest month of the year and took part in twelve blog tours. I also attended two book events, First Monday Crime on the 4th February and the two-book-launch for Changeling by Matt Wesolowski and Deep Dirty Truth by Steph Broadribb which took place at Waterstones Tottenham Court Road on Monday, 11th February. It was brilliant as always to catch up with friends from the blogging world and to meet some new faces for the first time, including Janel from Keeper of Pages, Beth from bibliobeth and Mart from The Beardy Book Blogger. If you haven’t checked out their blogs yet, you should definitely do so. This month at First Monday Crime we had Lucy Foley, author of The Hunting Party, Will Dean, author of Red Snow, Gytha Lodge author of She Lies In Wait and William Shaw, author of Salt Lane. It is a quieter month on the blog tour front for March. The first one I have in the diary is for A Gift for Dying by M.J. Arlidge which I am posting a review for on Tuesday, 12th March. If you are in the area close to City University, London on Monday, 4th March and if you’re a lover of crime fiction, then come along to First Monday Crime. There’s another stellar line-up of panelists for next month including M.J. Arlidge, Fiona Barton, C.J. Tudor and Laura Shepherd-Robinson. Doors open at 6.30 p.m. and you can reserve your FREE space by clicking here. The closest tube stations are Farringdon and Angel. So that’s it for another month. What are you hoping to get round to reading in March? As always it’ll be brilliant to read your comments. I’m delighted to be joining the blog tour for Winterman by Alex Walters on my blog today. DI Ivan Winterman is a man with a troubled past. The Blitz has left his young son dead and his wife seriously injured. He has made enemies in high places and, with his career going nowhere, he returns to his home town in East Anglia, seeking to rebuild his life in a country gripped by post-war austerity and the coldest winter on record. As the first snow begins to fall, a drunken ex-clergyman stumbles on the semi-mummified body of a small child concealed in a ruined cottage. Days later, a second similar child’s body is found in a Fenland dyke. Both bodies have been dead for several years, preserved in the Fens, the cause of death unknown. Winterman, supported by a small team of assorted misfits, finds himself leading the investigation, uncovering a web of connections and secrets in the small rural community. When a further murder victim is discovered, Winterman discovers that the secrets are darker and the threat far more immediate than he’d ever envisaged. 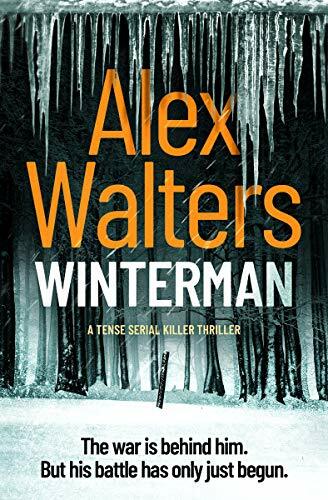 Winterman by Alex Walters is a dark, dark crime novel, set in the depths of winter just after the Second World War which has devastated Britain and Europe. There is plenty of atmosphere in this book; I could feel the bite that winter had on the residents of the village where the book is set, and there was a really sinister tone that kept me gripped. I think I was looking at about every single one of the characters as I tried to work out who was behind the crimes that had taken place, and there are some disturbing ones. There’s a really chilling opening scene in which we see rising panic ensue after a young boy disappears just before a blackout. Several years later and DI Ivan Winterman arrives in the town and it isn’t long after his arrival that a child’s mummified body is found. And it isn’t the only body to be discovered. This is a town where crimes very rarely happen, and Winterman knows he has a tough case on his hands as he attempts to piece back evidence that goes back over the years. I thought that the author conveyed a real sense of place and time in this book. We can see the effects that the war has had on the local community and on the wider country with rationing still in force. Rationing carried on in this country for years after the war, as Great Britain rebuilt itself. DI Ivan Winterman was a character who I really engaged with. It was fascinating to see how the other members of the police team took to him, and how they worked together, as he has just taken on one of the top jobs in policing. I was wondering if this was going to cause a few issues as no one from the team was promoted to the role. I don’t think I would be too happy if an outsider came in and took the top job. The structure of the novel was cleverly thought out, and it did have some heartbreaking reveals towards the end which I don’t think I’ll be forgetting about for a while. And there was a heart-pounding conclusion. The ending did give me chills as I wondered if such things did actually occur during the period that the book is set, and it wouldn’t surprise me at all if such goings on did actually happen. The whole plot just kept me gripped. I wanted to find out who the children were who had been uncovered, and especially, as reports came about that children had started to disappear from the area a few years ago. Of course in the time period the book is set, policing was a lot harder than it is today, as they didn’t have the advances in science we have today available to them. It seemed to me that there was something much more going on here, which was hiding in the shadows and I feared that this wasn’t going to be over for the residents of the town any time soon. If you’re a fan of historical crime fiction then definitely give this book a go. It’s a real page-turner that will chill you and keep you utterly gripped. If you would like to purchase Winterman, you can do so by clicking on the following link below. I’m delighted to be joining the blog tour for Fran Dorricott’s debut novel After the Eclipse. I also have a copy of the book to giveaway, check out my Twitter page for your chance to win a copy. All you have to do is RT my pinned post on my twitter profile @collinsjacob115 and follow my account before Monday, 4th March 2019. One winner will be drawn at random. Good luck! A little girl is abducted during the darkness of a solar eclipse. Her older sister was supposed to be watching her. She is never seen again. Sixteen years later and in desperate need of a fresh start, journalist Cassie Warren moves back to the small town of Bishop’s Green to live with her ailing grandmother. When a local girl goes missing just before the next big eclipse, Cassie suspects the disappearance is connected to her sister – that whoever took Olive is still out there. But she needs to find a way to prove it, and time is running out. 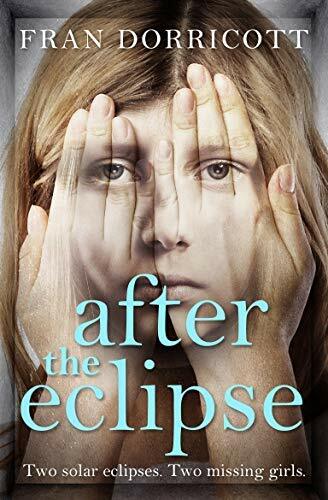 After the Eclipse is a harrowing tale from debut writer Fran Dorricott, telling the story of two missing girls, sixteen years apart, but both take place against the backdrop of a solar eclipse. It’s a book that I was really looking forward to reading, and it didn’t disappoint. We meet Cassie who’s younger sister, Olive was abducted during the last solar eclipse that took place in 1997. Since her sister disappeared, Cassie has been racked with guilt, blaming herself for not looking after her properly and giving someone the opportunity to take her. Sixteen years later and Cassie is moving back to her home town, and another young girl is missing. She’s convinced that the girl has been taken by the same person who took Olive, is she finally about to find out what happened to her missing sister all those years ago? At its heart, this is quite an emotive tale, and the grief of Olive’s family plays very strongly. I could feel the loss that Cassie feels for her sister and her desperate need to find out what had happened to her. You can’t really begin to imagine what families in these situations are going through. As I was reading the book, it did make me think of the Jaycee Dugard case in America, who was held captive by her kidnapper for eighteen years before she escaped. Using the solar eclipses made this novel feel quite atmospheric, I thought this was done very well, and it gave the story a much darker tone, creating an impending sense of doom that made me feel nervous for the characters in the book. We also get to see events which took place at the time Olive disappeared, and Fran constantly kept me thinking how things were going to pan out for Olive as I got to learn more and more about what had taken place. I was desperate to find out who had committed the crime and if the two cases were in fact linked as Cassie suspected. Why would they want to take another child sixteen years later, risking the chances of them getting caught? What was their motive here? After the Eclipse completely gripped me from start to finish. Fran Dorricott is a talented writer who I am excited to read more from. Thank you to Sarah Mather at Titan Books for inviting me to take part in the blog tour and for sending me a copy of the book in exchange for an honest review. If you would like to purchase After the Eclipse, you can do so by clicking on one of the following books. On my blog today I’m sharing my thoughts on the gripping second novel in the DI Natalie Ward series by Carol Wyer, Last Lullaby. I read this while I was away for a few days the week before last and I finished it in just two days. When the body of young mother Charlotte Brannon is discovered by her husband in their immaculate, silver bedroom, Detective Natalie Ward is first on the scene. The killer has left a chilling calling card: the word ‘Why?’ written on the wall in blood. Determined to find justice, Natalie quickly discovers the husband is hiding a troubled past, and she’s sure the teenage babysitter’s alibi doesn’t quite add up. But before Natalie can dig deeper, another mother is murdered, her young son left distraught, staring at a fresh ‘who’ scrawled beside her. Natalie knows it’s only a matter of time before the killer strikes again, but all the key suspects have alibis. It’s her toughest case yet, and with her marriage hanging by a thread, the cracks are beginning to show. Just when Natalie finds an unsettling clue she thinks could solve the case, another young woman and her baby disappear, and a member of Natalie’s team is put in terrible danger. Can Natalie stop this twisted killer and save one of her own before more families are torn apart forever? I finally got round to reading the second book in the DI Natalie Ward series by Carol Wyer, Last Lullaby, and I absolutely loved it. I knew I was in for a treat as I really enjoyed the first book The Birthday and it only took me three days to finish it. If you’re not yet reading Carol’s gripping new police procedural series, then you really need to get your skates on as the third book is out very soon. DI Natalie Ward is a character who is really starting to grow on me. She is passionate about her job, although this does cause some tension in her home life, as in her mind, her career and commitment to the victims of the crimes she is investigating comes first. And it is her commitment to her job that is causing some frictions. Straight away Carol starts building the tension as a young couple making their way home are being tailgated by another car causing them some alarm. A short while later, Charlotte Brennan is discovered murdered, although her baby son, Alfie, who was close to her at the time of the attack remains unharmed. When Natalie and her team start to investigate, they believe that someone close to Charlotte and her husband, Adam may have murdered her. But soon another murder takes place, and a chilling sequence of events follow. Carol throws in plenty of twists and turns in her latest book which kept me asking questions about the characters. There are plenty of suspects for the team to investigate, and you get a real sense of how difficult this case is going to be for the police as there are many people here who don’t want to tell the truth. Also falling under suspicions is Charlotte’s own husband Adam and I could never quite be sure how I felt about him, especially as he has quite a murky past himself. This is another excellent novel from Carol that will keep you hooked all the way through. I really liked how everything came together in the end. Last Lullaby is totally engaging with a gripping mystery to follow. As I said earlier, if you’re not yet following this series, you really need to be. Roll on book three. If you would like to purchase Last Lullaby, you can do so by clicking on the following links below. Bad Seed opens up with a rather gruesome discovery that sets a dark tone. The body of a young woman is found, and it appears as though someone, the killer, has attempted to perform a Caesarean on her. DI Kate Fletcher and her team face a complex investigation, which isn’t helped when fractions soon start to appear in her team, especially when it turns out that one of them may be leaking information to the press. Kate has a tough case on her hands, and when the body of a second woman is found in similar circumstances, they know that there isn’t going to be a swift resolution. Heleyne has given Kate a very complex investigation to tackle in the latest book in the DI Kate Fletcher series. From the very start, I just had this feeling that this wasn’t going to be easy for Kate and her team. The police procedural aspect to this book is very well written, especially the detail that Heleyne puts into discoveries made during the post mortem, and this prompted me to think a lot about what was going on here. Why was someone targeting these women in this way? Parts of the book do make for an uncomfortable read, but this adds to the tension, and I was rooting for the police to catch the individual responsible. I could also feel the frustration that the police were feeling at the lack of leads they had to pursue. This is one of those crime novels where you just have to find out who the culprit is. I also really liked that we got to learn more about Kate’s colleague, Dan Hollis. We learn a lot more about his upbringing and his family life in this book, and he too, makes some unnerving discoveries about his past which he is keen not to make common knowledge. I’m interested to see how this part of the story will develop in future books. This formed an intriguing back story; there were times when I just felt really sorry for Dan. Heleyne did have me wondering if what he was being told was actually true and as the story took another turn towards the end, I couldn’t help but feel the same as some of the police officers. But I’m not going to go into any detail here as to what I mean by that, you’ll have to read the book to find out. Overall I thought Bad Seed was an enjoyable and an intriguing read. I think there were times when I would have liked for there to have been a little more tension, but I was kept interested in the plot, and I wanted to see how the story was going to unfold at the end. I definitely wouldn’t hesitate in recommending this series to fellow police procedural fans. If you would like to purchase Bad Seed, you can do so by clicking on the following link below. 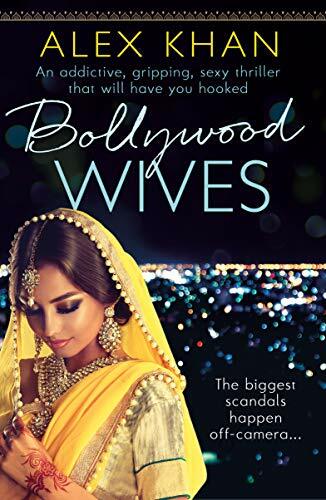 Today I’m closing down the blog tour for Alex Khan’s dark and glamorous novel Bollywood Wives. Bollywood Wives is so fresh and exciting. Alex Khan takes you into the glitz, the glamour and the dangerous world of Bollywood, as competing stars fight to work their way to the top, and there are some who will do just about anything to get there. Alex’s writing is utterly immersive as he begins to peel back the layers of this world and as he explores the lives of his characters which are fleshed out really well. There is so much I want to say about this book. I absolutely loved Zara, who is the first person we are introduced to. Zara is a complex character; she comes from a poor background but has swiftly risen to become one of Bollywood’s brightest stars. But her career is always under threat, either from rivals who want to steal her crown or extremists who are plotting to kill her. The beginning of the book opens up with one such threat when there is an attempt on Zara’s life. Zara is due to appear in a new film, and the production team swiftly relocate to London for her safety. I did find that my opinion of Zara kept changing the more I got to know her character. She could be quite a gentle person at times, and there were often times when I felt sorry for her, but she could also be incredibly selfish. If you’re familiar with Alex’s previous work, you will be able to see that this is very different to what he has written before. It’s a book that will pull you into the lives of the characters and their devious ways. You get a real sense of the characters feelings towards each other in Alex’s writing, and there is a lot of spitefulness and rivalry going on which is what made it so exciting. I was totally surprised by the ending of this book, and it took a direction that I didn’t see coming. I really enjoyed reading it, and I hope that Alex continues to write more books set in this world. If you enjoy books filled with drama and characters that will keep you entertained and gripped, then I highly recommend it. Thank you to Tracy Fenton at Compulsive Readers for inviting me to take part in the blog tour and to Hera Books for providing me with an advance reader copy via Netgalley, in exchange for an honest review. If you would like to purchase Bollywood Wives, you can do so by clicking on one of the following links below. I’m thrilled to be talking to Phoebe Morgan today, author of The Girl Next Door as part of the blog tour. I really enjoyed her debut novel The Doll House, so I can’t wait to read it. Hi Phoebe. Thank you for taking the time to answer my questions. Firstly can you tell us a little bit about what your new book is about? Of course! 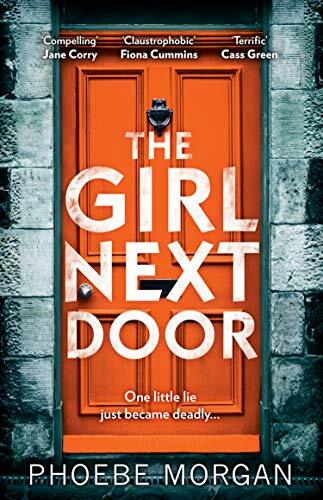 The Girl Next Door is a psychological thriller about a claustrophobic, close-knit community of middle-class people who are hiding secrets behind closed doors. It tells the story of Clare Edwards, a 16 year old girl found dead at the start of the book, and the subsequent police investigation into how and why she was killed. What is your writing process like? Do you plan everything out before you put pen to paper or do you let the story evolve as you’re writing? I wish I planned everything out but I don’t think it’s the way my brain works! I tend to have an idea or a few characters in my head and begin writing, and often I have an idea of how I want the book to end as well – and then the middle sections I make up as I go along! I find that once I start writing, new ideas come to me, but I do often go back and rewrite, meaning that the editing process can be a bit painful at times! But my day job is as an editor so I actually quite enjoy that part of it – it’s easier than the gruelling first draft! It usually takes me a few months to write the first draft, and then editing could take another month or two on top of that. At the moment, I have one book a year coming out (The Doll House was out last year and there will be a book three in 2020) and that schedule suits me – I’m not sure I could write any faster what with working full time as well! Have you always been drawn to the crime genre? When I was younger I read less crime and more what the publishing industry would term ‘women’s fiction’ – people like Jane Green and Sophie Kinsella, but as I grew older I started reading psychological suspense and now I can’t get enough of it! I’d say I read more suspense than straight crime, although if a detective is likeable and believable (something I think Paula Daly does very well) then I can enjoy police procedurals a lot too. I love a good twist and although there is a lot of suspense out there at the moment, I think as long as you’ve got a strong enough plot and a clear, unique voice, there’s still room for more books on the shelves! Are there any other genres you’d like to explore in your writing? I’ve always wanted to write short stories, and I do sometimes for magazines or just for fun, so one day I’d love to write a whole book of those although I’m fairly sure nobody would buy it… I’ve also had a historical fiction idea in my head for a few years, which I hope to eventually finish! Did the process of writing your second book change compared to when you wrote your first? I suppose it was more pressurised – I had a one book deal for my debut and then a two book deal for books two and three, so I did feel the slight tension there as to whether my publishers would like it and whether it’d be good enough for them to make my agent an offer. But I think I also felt more confident, because I knew I had got to the finishing line of a book before so I just had to keep reminding myself of that and reassure myself that I could probably manage to do it again! When you published The Doll House how did it feel to have your book out there in the world for the first time? Oh it was amazing! I was so happy. It’s something I had always wanted to achieve so it was wonderful seeing people reading it and hearing the reader responses. Luckily most of them were positive though of course there’s always the odd one star review from someone who didn’t like it, but because of my day job I think I’m reasonably immune to that now. I was very pleased to be able to give copies of my book to my family and to people who had supported me along the way, that made it all feel worthwhile. If you could pass on one piece of advice to aspiring writers, what would it be? Don’t give up! Everyone says it but it is so true. I never thought my first book would see the light of day but this morning I got the news that it’ll be translated into French, as well as a few other territories – so you honestly never know what will happen in the future if you keep going. And if you don’t sell your first book, you might sell your next one. I know tons of authors who didn’t sell their debut and went on to do brilliant things. Keep writing as long as you still enjoy it, and remember that getting a book published is not the be all and end all. Don’t let it define you, because I think that can start to feel really unhealthy and upsetting if you put all your focus on what is essentially an industry that revolves around luck and timing a lot of the time! Remember to live your life and if you need a break from writing, have one. Just go back to it if you’re serious about getting published – you will get there. How will you be celebrating publication day? And finally, is there anything you can tell us about what you are working on at the moment? I’ve almost finished my first draft of book three so will send that to my editor soon. The working title is The Babysitter though that might change, and it’s about a couple who go on holiday to France – only for the doorbell to ring and the police to arrest the husband on suspicion of a murder back in the UK. And then a baby disappears… It is out in 2020 and I hope you all like it! Thank you to Phoebe for taking the time to answer my questions and to Lucy Richardson at HQ for the invitation to join the tour. If you would like to purchase The Girl Next Door, you can do so by clicking on one of the following links below. Gethin Grey is the man you call when there’s nowhere else to turn. Izma M was sent down years ago for the brutal murder of a young woman. In jail he’s written a bestseller and become a cult hero, and now the charismatic fading-film-star Amelia Laverne wants to bankroll Gethin to prove Izma’s innocence.For Gethin – low on luck and cash – the job is heaven sent. But is Izma M really as blameless as his fans believe? Private detective Gethin Grey may just have been handed is most high profile case yet. A man convicted of murdering a young girl two years ago has prompted many people to believe that he has wrongly been imprisoned and that he was made a scapegoat by the police, while the real killer still remains at large. The man who has been charged with the murder, Izma M, has gained a huge following and has become a bestselling author. His plight to prove his innocence has caught the attention of a film star who enlists the services of Gethin. Gethin and his team take on the case with much enthusiasm, but soon they begin to get sucked into a dangerous series of events, and it even seems that those closest to Izma are keen for him to stay behind bars and for Gethin and his team not to investigate the case at all. Fade To Grey is the start to a new series that I’m sure will gain lots of fans. This book has been compared to J.K. Rowling’s Strike novels, and I can see why. Gethin leads an engaging team of detectives, and each character adds something fresh and intriguing to the story. Gethin himself is a character who I am also keen to find out more about; he is going through a rather difficult period in his own home life, and I thought that John Lincoln portrayed this well in his writing. I also found his relationship with his father, who he refers to as “the judge” fascinating and it is something I’d like to see develop further as the series progresses. The crime that Gethin and his team are investigating pulled me into the story. We also see past events that place several years before the murder takes place and I wondered just how this was going to relate to what was happening in the present. I never could be sure if Gethin was going to be able to prove the innocence of the man who had been convicted. John Lincoln kept me turning the pages as I wondered just what was the bigger picture here. This is an exciting introduction to what I hope will be a long-running series, and many readers I’m sure will become quickly engaged by the characters. Thank you to Anne Cater at Random Things Tours for inviting me to take part in the blog tour and to Katherine Sunderland at No Exit Press for sending me an advance review copy. 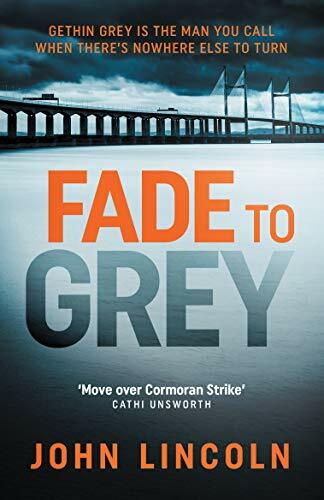 If you would like to purchase Fade to Grey, you can do so by clicking on one of the following links below. 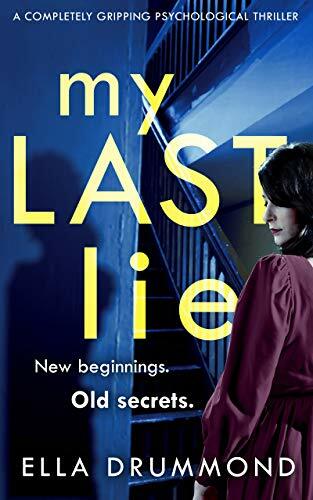 My Last Lie is an engaging story from Ella Drummond. The blurb and the cover caught my eye when I first saw this book mentioned and I couldn’t wait to start it. We meet Pilar and Theo who are making a fresh start in Cornwall after suffering a devastating trauma from losing their baby. Pilar begins to make friends in the local community and sets up an art class at her home. For a while everything appears to be going perfect in their lives, they are living in their dream home, and they seem to be getting on with the rest of their lives. But someone is on the outskirts watching, waiting for their moment to strike and they are determined to make sure Pilar suffers for the secrets she is hiding. I think what I enjoyed most about this book was Ella’s writing. It is engaging, and I grew interested in the lives of the characters on the page. Ella did keep me thinking that something dangerous was about to happen and I did feel on tenterhooks as I kept expecting something to happen to Pilar or Theo, especially when strange things start to occur in their home. This is a story that does take time to build. It isn’t fast paced, but there is an edgy feeling to the plot which does create a sinister tone, and there are definitely some scenes that got my heart racing as I began to wonder what secrets were going to be revealed. And I have to say that Ella Drummond did turn the tension up a notch in the final chapters when we finally get to learn the truth about what happened in Ella’s past, which she managed to keep under wraps. There was a sinister ending which is making me wonder what is happening to the characters beyond the final page. This is an engaging debut that will draw you into the lives of its characters. I will definitely be looking out for more from Ella Drummond. If you would like to purchase My Last Lie, you can do so by clicking on one of the following links below. Good evening everyone and welcome to another addition of WWW Wednesday, hosted by Sam at Taking on a World of Words. Here are my answers to the questions below. 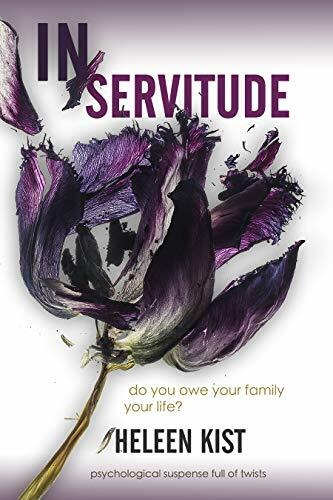 I’m only a few chapters into In Servitude and Heleen’s writing has me utterly gripped. I’m looking forward to finding out how everything pans out. Winterman has started with a very dark and foreboding opening. This is a novel that I know I’m going to enjoy. 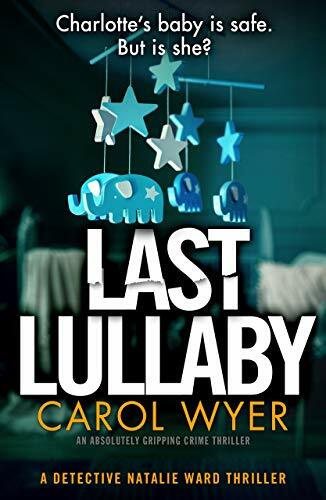 Last Lullaby by Carol Wyer. This is the latest book in the Detective Natalie Ward series which I thoroughly enjoyed. I’ll be sharing my thoughts on my blog very soon. 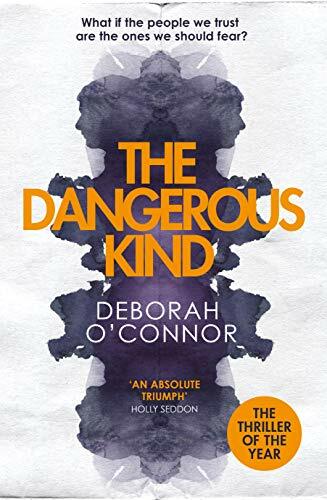 The Dangerous Kind by Deborah O’Connor. This is a book I’ve had sitting patiently on my shelf since I picked a proof up last summer at the Theakston Crime Festival. I’ve read some rave reviews already so I’m really looking forward to starting it. So that’s it for another week. It’ll be great to read about your reading week in the comments below.